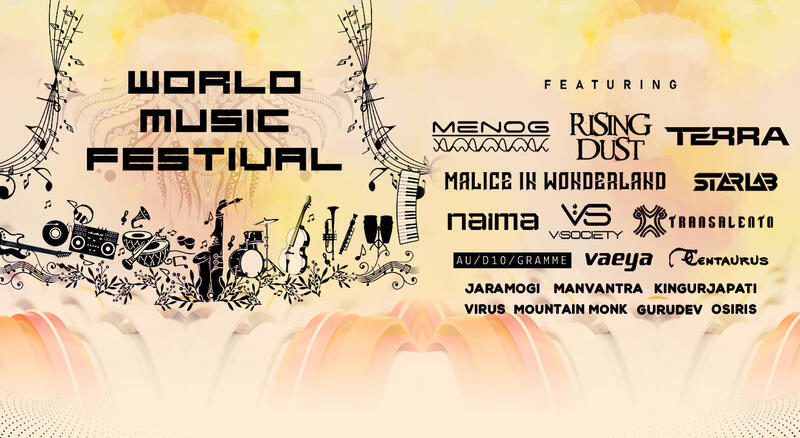 Accept, Vaeya, Centaurus, V-Society, Starlab, Menog, Malice in Wonderland, Kingurjapati, Mountain monk, Virus, Audiogramme, Rising Dust, Terra, Naima, Manvantra and many others will be performing at the World Music Festival! Rising Rust is proving on every dance floor they hit that their unique style is not only mind-blowing and spiritual, but also highly danceable and brings high energy levels to all the receivers in the crowd. They started their way individually on 2005 when Ami Dahan aka A.M.i & John Aharon aka Mojo met in a party in 2012. With the talented hands of mister Karen Bagdasarov aka Bubble, who made the first connection between the duo that formed a band that no one can stay indifferent to R.I.S.I.N.G D.U.S.T. After releasing their first EP on Blue Tunes called "Dust Everywhere," the duo released a debut album on Mushy Records called “The Resistance.” After less than a year, they released their second album which was a massive hit in the psytrance community. The 3rd album released on February 2017. "We see ourselves getting bigger and badder - we love technology and what it has to bring. We are always on the top of our game when it comes to tech,"
So follow the Dust Cloud whereever you see it. That's where you wanna be. TERRA, also known as Bar Levy, is a 26 year old psytrance producer from Israel. Bar started his journey with electronic music at 2005 when he was 15 years old, DJ dreaming on the biggest stages. After years, he decide to open his psytance project, TERRA, bringing fresh, energetic psychedelic trance with ethnic and oreintal flavour, combinging different cultures with fresh, full-on vibes. He joined Nutek Records in 2017 with his first release ever, "First Of Us." Now, Bar is looking forward to spread the TERRA sound at the biggest stages all over the world. Vaeya is a music producer and DJ based in New Delhi, India, specializing in progressive trance. His live/DJ sets can range from dark, intelligent and techy to lush, quirky and fun depending on the environment and atmosphere. Over the years, he has released tracks on Fatali Music, Glitchy.Tonic.Records, Rebeat, Twisted Frequency Recordings, Ovnimoon Records, Carmi Recordings, Occulta Records, Maia Brasil Records, Jellyfish Frequency Recordings and Zenon Records. Vaeya spent seven years living in Australia from 2003. The diversity of the people and music at the parties and festivals he attended, alongside the extreme vastness and untouched beauty of the country, became a huge influence on his subsequent music production and DJ sets. Being amongst a scene where artists such as Sensient, Tetrameth, Shadow FX and Autonomech played on a regular basis was a massive inspiration. This emerging sub genre of progressive trance, now described as the signature ‘Zenon’ sound, captivated him the most. Vaeya’s first solo album, "Passion Before Priorities," was released on his Bandcamp page in 2009. On returning to India in 2010, Vaeya joined forces with Indian based progressive trance label Occulta Records, where he released further material. In the same year, he released his second full length album, ‘Bipolar,’ on Germany’s Glitchy.Tonic.Records, an EP on Fatali Music and since then a number of tracks on various compilations. In 2014, Vaeya was signed as the official Zenon Records DJ in India and can be found playing cutting edge sets, representing this sound at parties and festivals both inside and outside of India. He is currently working on his third studio album and a brand new live set. V-Society is signed up with top Indian label Digital Om Productions; his music is praised for its driving and uplifting melodies, intensive dedication to detail and quality, and a plurality of innovative soundscapes. Recently having produced his well received single with Relativ named 'Beyond Reality,' & a collab EP with Relativ called ‘Enigma,’ both featured on Beatport Top Tracks for over 6 weeks and his first compilation, CD Universal Religion 2 'The Awakening' is regarded as one of the most successful and intelligently charted release still roaring high on success filled full with inspiration. In 2016, he released a massive remix to Sonic Species 'The First and the Last' with Relativ. V-Society has started working his solo production. His style is best described as a dynamic mix of fresh psytrance, where exuberant basslines and gorgeous atmospheric tunes are the main focus. A marvel in Indian music scene, today his name has become synonymous with quality music, pure rhythms and melodic beats. V-Society has played alongside some of the biggest names in the psytrance world like - Astrix, Ajja, Tristan, Avalon, Sonic Species, Dickster, Burn In Noise, Mad Maxx, Liquid Soul, Ritmo, Vini Vici, Symbolic, Audiotec, Zen Mechanics & many more. StarLab is a project initialized by Bharat from New Delhi, India. Training in Indian classical music laid the musical foundations for Bharat at a very early age. Over the years, as a self taught vocalist, bass & guitar player, he gathered a wealth of experience touring and recording with his band for over a decade until he encountered the hypnotic sound of psychedelic trance music at a beach party in Goa, India. This strongly affected his musical persona, after which he began to teach himself synthesis & music production and hence, project StarLab was born. In 2011, he went to California, USA, to study music and quickly became a popular DJ in the California scene and gained a lot of experience playing many local parties and festivals. On returning to India in 2013, he joined ranks with India’s premier record label Digital Om Productions as live act, and since then, he has gone on to make countless releases with the most well known record labels and performs in top festivals and venues in India and around the world in USA, Mexico, Brazil, Japan, Portugal, France, Germany, Serbia, Croatia, Switzerland, Spain, Thailand and Nepal. These include main stage performances in famous festivals such as Universo Paralello - Brazil, Antaris Project - Germany, Shankra Festival - Switzerland, Exit Festival - Serbia, Electric Daisy Carnival – India, Sunburn Festival – Goa, Universal Religion – Nepal, Experience - Thailand and many more. StarLab has released music with renowned labels such as Digital Om, IONO Music, Techsafari, TesseracTstudio, Sacred Technology and also selected by ASTRIX for his VA compilation Book of Changes on Future Music Records. Menog has been a musician since almost his birth, and played from guitar to drums in his metal band in early 90s. His introduction and interest for electronic music started in 1995 with the techno scene in Portugal; in 1997, he went to his first trance event. Boom Festival 1998 made him think about doing this type of music. Four years later, in 2002, Dani released his first album "Natural Behaviour" under the name Menog on the label Starsounds Rec. from Greece. Menog is one of the founders and manager of Spectral Records. In 2005, he released EMOTIONS! cd002 from Spectral Records, and the 2nd solo album. He released several tracks on various compilations and labels worldwide, like Spectral Records, Nutek, 3Division, Shiva Space Tech, Phantasm, SpaceTribe Music, Digital Psionics, Acidance, Timecode, Nexus Media, Planet Ben, Fungi rec, Noize Conspiracy, Hadra, etc. Lately, Menog's music is being played worldwide through his emotional and enthusiastic live appearances. In the last years, he played all over the world, like Australia, Japan, India, Brazil, Israel, South Africa, Russia, Dubai, Morocco, USA, Finland, Cyprus, Macedonia, Turkey, Greece, Mexico, Germany, Belgium, Italy, Sweden, Denmark, England, Spain, Portugal, etc. Menog's 3rd album was released on Nutek Records (CPU's label), which was a remix album, something that Dani wanted to do for a long time. Remixes from CPU, Space Tribe, Bliss, Rinkadink, Shift,Audialize, just to name a few. His 4th album, "Musically Speaking" was released in the end of 2008 on Spectral Records, and it has been hitting dance floors all over the world. Menog released his Digital EP called "I See Change," out on Spectral Records in 2012. Emotions are what he wants to transmit to people when playing live, on stage. His music is a story with a beginning, middle and ending. His tracks are made with a single purpose - to make people dance! Malice in Wonderland comprises of Thomas aka Jaramogi, a music enthusiast from Austria, with Iranian/Mexican background. The wide variations of sounds, rhythmic structures and textures which seem to move through otherworldly sound dimensions are giving his compositions a very unique and special character. MIW's live sets are intended to be a sonic trip and cover the many faces & various aspects of the tunes in an effective combination to emphasize a contrast between intricate harmony & distorted screams of raw energy and emotion. Over the last couple of years, he appeared on various compilations & EPs, released 2 albums and performed in more than 35 countries all over the world. Originally started as a collaboration with Matakana & Gargamel, the project is now beeing continued by him solo (since 2011). Audiogramme - AU/DI0/GRAMME aka VIAL, is the brainchild of Delhi based producer Vikrant Rathore, known for his distinctive and varied electronic/psychedelic sounds. Playing his first ever DJ set in 1998, it has been a long evolving journey. As AU/DI0/GRAMME, he is best known for his melodic and cutting edge morning/progressive psytrance, and his unstoppable energy on the console. Currently (2016-17), he has being ranked among the top 3 artists/DJs in India under the psytrance category by the prestigious VH1 MY MYFAV awards (India's biggest Peoples Choice Awards Poll). Sharing stage and performing with artistes such as ASTRIX, ASTRAL PROJECTION, TRISTAN, AVALON, PVD, SKAZI, G.M.S, ACE VENTURA, LIQUIDSOUL, JUDGE JULES, X- NOIZE, MARCEL WOODS, SOLAR STONE, to name a few, has given him the opportunity to take his music to a more global audience and share his magic music on the dance floor. Constantly travelling, and with a busy gig schedule, he has earned the love and affection of his listeners and fans across india. He has been a constant on lineups for various festivals like Sunburn, Mountain Madness, Vh1 supersonic and more. A degree in music production from the much respected music & creative media school Point Blank Studios, London, has helped him even further to crave his music and get a deeper knowledge of sound. His new project 'VIAL' is focusing majorly on producing and playing night psychedelic music, groovy baselines with complex arrangements and forest elements is how you can define his sets as VIAL. NAIMA - Sarah Naima grew up in an old hippie environment and extraordinary musical family; love and sensitivity for music came quite early in her life. In the year 1996, she came in touch with electronic music for the first time. Since then, she has been following many different styles in the electronic scene with big enthusiasm until she made the experience of a psychedelic-trance party in the year 2003. Naima started her journey as a DJ seriously in 2009, the finesse of her DJ sets contrasts with the violent energy she brings to the stage: her selection, mind-blowingly psychedelic, will take you into the mystical and powerful depths of psytrance made in Sangoma. During the last years, Naima grew as an international DJ, and she has performed on various international parties and some of the best festivals all around the world like Ozora Festival - Hungary, Experience - Thailand, Midnightsun Festival - Norway, MoDem Festival - Croatia, Antaris, Freqs of Nature, Waldfrieden, VuuV - Festival - Germany, Blackmoon Festival - Italy, Solstice Festival - Netherlands, Transahara - Marocco, One Love - Switzerland, Kosmos Festival - Finnland, Yaga Gathering - Lithuania, Galaxy Evolution Festival - India, Belantara - Malaysia, Spiritual Ritual Festival- Nepal. Australia, Austria, Brazil, Belgium, Canada, Croatia, Czech Republic, Denmark, Finland, France, Germany, Greece, Hungary, India, Italy, Mexico, Malaysia, Malta, Macedonia, Nepal, UK, Netherlands, Norway, Lithuania Portugal, Poland, Romania, Russia, United Emirates, Spain, Sweden, Switzerland, Slovenia, Slovakia, Thailand, Turkey. Naima is signed as a label DJ for Sangoma Records. Kingurjapati - Here comes a soul with the miracle to heal the rebirth of the universe to keep it beautiful forever and ever. Kingurjapati synchronizes with the energy of the surrounding by the vibration of your vibes into tunes to make you jamming up on your feet; yes, Kingurjapati is one of the magicians of this mystical universe. Kingurjapati thought of cure miracle with his experience mythlogy grooving dancing vibration, this is a page for all the beautiful souls in universe who want to make the people manifest on Kingurjapati tunes & vibes. Explore, learn, teach and share all the knowledge and give this universe some magical vibes. Join Kingurjapati for this evolution of mind, karma , time, space, happiness, unity, peace, magic & miracle. ACCEPT, the teutonic metallers, could already claim big worldwide success with Blood Of The Nations and Stalingrad, but with Blind Rage, they reached the pinnacle of their career in the form of the pole position, a #1 album. Besides #1 in Germany, ACCEPT also hit #1 in Finland as well as several top 10 positions; Czech Republic, Hungary, Sweden, Switzerland, the UK and last but not least the US. After releasing a string of metal classics in the 80s such as Breaker (1981), Balls To The Wall (1983) and Metal Heart (1985), which made them iconic, the band with Wolf Hoffmann and Peter Baltes still haven’t peaked, especially if you glance across their touring schedule; ACCEPT have headlined Woodstock Festival Poland, Wacken Open Air, Czech Masters Of Rock Festival and Bang Your Head!!! Festival, Germany – amongst countless other performances over the last few years. Their Bang Your Head!!! performance was also filmed and released in the form of a live DVD/Blu-ray + 2 CD package titled Restless And Live (2017), reminiscent of their classic Restless And Wild (1982). With this DVD in the fans’ hands, ACCEPT could cement their previous success from Blind Rage by hitting #1 in the Swedish and German DVD charts amongst others. ACCEPT continue along the path they started with their three previous records, which is why the band has recorded their 4th studio album since 2010 once again with Andy Sneap. The exceptionally detailed artwork was created by Gyula Havancsák. “Previously, our cover artworks had been really simple and focussed on one message. But this time, we wanted to make it more interesting by using an atmospheric picture where you can find a lot of hidden details, but also with a clear and thoughtful statement present,” adds Wolf. The band delivers more than just a musical statement, with The Rise Of Chaos, in this case it’s a clear announcement (!) – with the straight forward opening track ‘Die By The Sword’ - galloping drums, lightning guitars and ACCEPT’s trademark choir instantly silence any doubt as to whether they’re still the top dog when it comes to top-notch teutonic metal. Second track ‘Hole In The Head’ leaves no time to breathe, before the title track kick-starts and tries to pummel its way through the listener’s ear canal. This song may evoke a sense of familiarity within listeners, because it was previously released with an impressive music video. After consuming the upcoming ‘Koolaid’ shake, ‘No Regrets’ keeps heads banging with its speedy guitar solos, which concludes the 1st half of the record. ‘Analog Man’ rings in the 2nd part, telling the story of the world increasing digitisation: Its haunting (pre) chorus should undoubtedly confirm its place in forthcoming ACCEPT set lists. Track number 8, ‘Worlds Colliding,’ marks the album’s most thoughtful song, swiftly followed by the fastest banger of The Rise Of Chaos, ‘Carry The Weight.’ After 45 minutes, the closer,'Race To Extinction,' lets the record fade out fittingly. The songs from The Rise Of Chaos will be performed for the very first time at Wacken Open Air 2017’s Night To Remember. Besides new ACCEPT tracks, Wolf Hoffmann will also bring his latest solo album titled Headbangers Symphony (2016), which showcases famous pieces by classical composers such as Beethoven, Vivaldi and Mozart (specially arranged for the metal world) on the stage for the first time ever; he will be supported by the Czech National Symphony Orchestra. The last and concluding third part of this once in a lifetime evening will be fulfilled with a classic ACCEPT set alongside the orchestra. “ACCEPT have been and are still a very important part of Germany’s heavy metal scene. We’re really looking forward to having them with us once more. With this epic concept, the Thursday evening will be one to remember for sure,” closes Thomas Jensen, organizer of Wacken Open Air.